Sold per sheet. 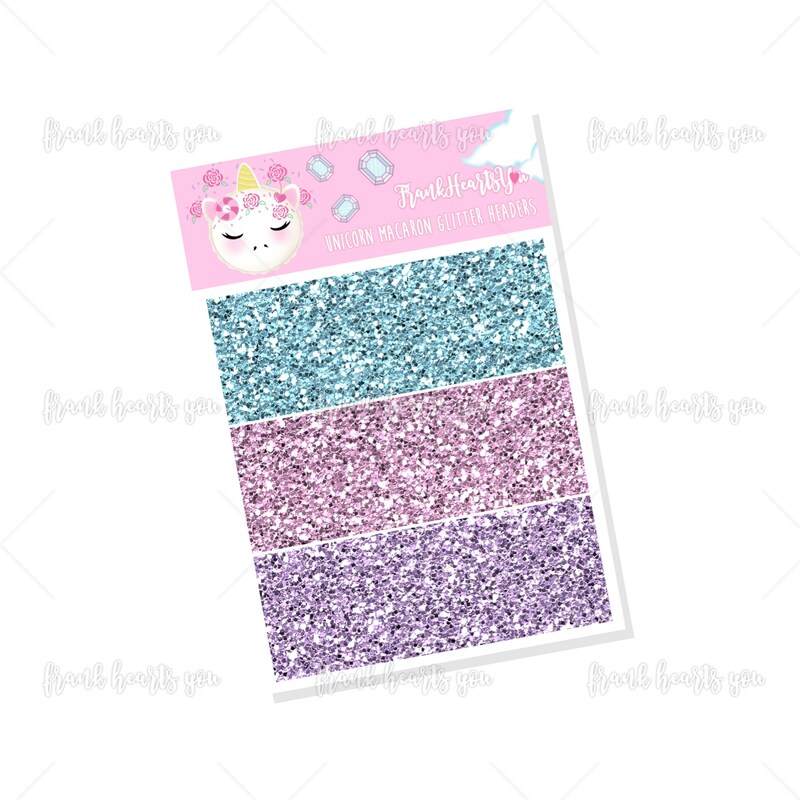 A mini sheet of coordinating glitter headers for the Sugar Rush kit. This is a glitter texture pattern. 3 colors, 8 strips of each. *Our stickers feature original artwork designed by us, so they are one of a kind! Actual product colors may differ slightly from what is visible on screen. This listing is for sticker sheet only; any accessories are not included! Also, please do not copy, imitate, publish, or redistribute our artwork without permission. Thank You! SHIPPING UPDATE! Please Read: AS OF JANUARY 21, 2018 USPS has changed their shipping rates and rules for both domestic and international post. The increase in shipping rates for the shop is a direct result of these changes. The increase for domestic orders is minimal and tracking and ship time remain the same. The rate increase for international orders is higher. Please check with your local postal service to check any additional questions you might have as to post rules and regulations as they vary by country. We will be looking for additional alternatives. However, presently, sending through USPS remains the most affordable option. We take great care when packaging and shipping your items; all orders will arrive in a StayFlat mailer to prevent tearing or bending during shipment. Shipping and handling is $3.95 per order unless otherwise stated. All items will ship USPS First Class Mail. A tracking number will be provided. We are NOT responsible for items damaged or lost by the postal service. USPS First Class Mail usually arrives within 1-2 weeks. HOWEVER, sometimes packages are delayed due to circumstances beyond our control! Please keep in mind that once we ship out your items, we are unable to control how quickly the package is processed by the postal service! Shipping and handling is $9.50 per order unless otherwise stated. We are NOT responsible for items damaged or lost by the postal service. ***International orders may be subject to customs fees and other charges or taxes that are OUT OF OUR CONTROL. Please take this into account before placing an order. ***International orders may take WEEKS to reach the destination! Once we ship your order, we are unable to do anything to speed up the shipping process. Shipping and handling is $12.50 per order unless otherwise stated. We are NOT responsible for items damaged or lost by the postal service. ***International orders may take WEEKS to reach the destination! The USPS website warns that International post takes anywhere from 10 to 999 days depending on your location. Once we ship your order, we are unable to do anything to speed up the shipping process. Thank you! One of my favorite planner sticker stores. This store uses the wonderful silky unicorn sticker paper that makes the stickers just that much more beautiful.